Complications arising from hysteroscopically-placed intratubal micro-insert devices are uncommon. Partial and complete perforations occur in approximately 0.9% to 2.6% while movement of the micro-insert device within the abdomen is even more rare. In this case report, the initial placement of the micro-insert device was uncomplicated, but concerns of cornual or fallopian tube perforation were apparent on the confirmation hysterosalpingogram (HSG) when free tubal spill was appreciated. After a succession of hysteroscopic and laparoscopic evaluations, and a final specimen dissection, the micro-insert device was found penetrating superior to the tubal ostia and embedded in the myometrium. Permanent sterilization by Essure® (Conceptus Inc, San Carlos, CA) is currently the only Food and Drug Administration (FDA) approved in-office hysteroscopic sterilization procedure in the United States (US). Over 600,000 procedures have been performed worldwide [1-4]. An analysis of sterilization procedures performed between 2005 and 2012 found that 38% of all procedures in the US were performed hysteroscopically . Hysteroscopic sterilization has the advantage of sterilization without an abdominal entry or the associated risks of an abdominal procedure. Additionally, hysteroscopic sterilization decreases procedure costs, operating times, and offers the option of placement in the ambulatory setting. Although the Essure® device is a highly effective form of sterilization with a 5-year effectiveness rate of 99.83%, it has not been without controversy . From the device’s introduction in November 2002 until May 2015, the FDA received a total of 5093 reports related to the device which ranged from complaints such as pelvic pain (3353) and irregular menses (1408), to fatigue (966) and weight fluctuations (936) [6,7]. In September of 2015, the FDA assembled a meeting of the Obstetrics and Gynecology Devices Panel of the Medical Devices Advisory Committee to hear expert opinions as well as patients’ experiences regarding the benefits and risks of the device [6,7]. In February 2016, the FDA published a sample black box warning regarding post placement adverse events and risks [6,7]. Additionally, in cooperation with the manufacturer, the FDA called for and has now implemented both improved patient information and counseling materials and the accrual of additional post marketing safety-related data. The FDA has never sought to remove the device from the marketplace and has held a consistent stance that the benefits of the device outweigh its risks [6,7]. 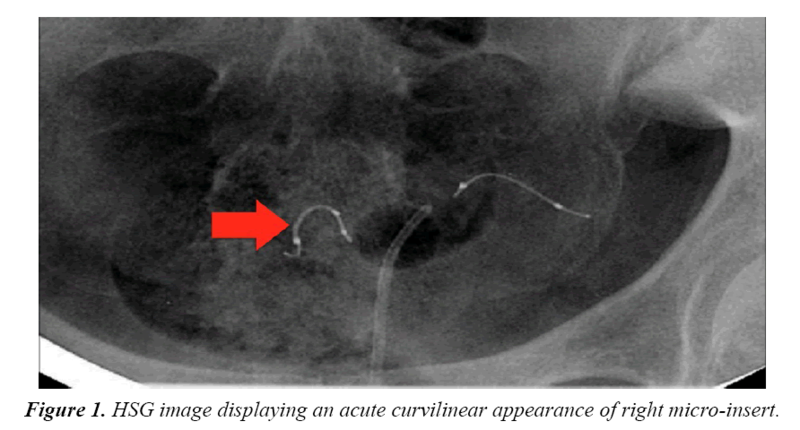 Our case report is in regards to a patient who complained of one month’s duration of menorrhagia after an uncomplicated inoffice hysteroscopic Essure® insertion. Free spill was apparent unilaterally on the confirmation HSG which was concerning for fallopian tube or cornual perforation. After a succession of hysteroscopic and laparoscopic evaluations, and a final specimen dissection, we found that the device had penetrated and embedded into more than 50% of the uterine myometrium without perforation through the serosa of the uterus. A healthy 44-year-old G3P2012 with satisfied fertility desired permanent sterilization after the delivery of her 2nd child. Her medical history was pertinent for 2 vaginal deliveries, 1 early first trimester miscarriage, and 3 umbilical hernia repairs that included mesh placement and removal. She was otherwise healthy without any significant past medical history or current medications. Due to the patient’s prior 3 umbilical hernia repairs, the decision was made to do an in-office Essure® sterilization procedure. The patient received a deep muscular injection of Depo-Provera (medroxyprogesterone 150 mg/ml) (Pfizer Inc., New York, NY) three weeks prior to the procedure. The procedure was performed 8 weeks postpartum by a resident physician under the direct supervision of an attending physician. In addition, the device deployment was observed by a Bayer product representative to ensure proper use and placement of the device. One hour prior to the procedure, the patient was given a low-dose benzodiazpene (diazepam 10mg) for anxiety and a low-dose oral opiate (oxycodone hydrochloride/ acetaminophen 5 mg/325 mg). Twenty minutes prior to the procedure, the patient received an intramuscular injection of a low-dose nonsteroidal anti-inflammatory drug (ketorolac 30 mg) for analgesia. Two and a half milliliters of 1% lidocaine was injected in the peri-cervical area at the 12, 4, 7 and 10 o'clock positions to create a cervical block. On hysteroscopic evaluation, no gross abnormalities of the uterine cavity or bilateral tubal ostia were appreciated. The micro-insert device placement was uncomplicated and the insertion was performed without resistance. At the conclusion of the procedure, 3 to 4 coils were noted to be trailing from the ostia bilaterally. The patient tolerated the procedure well and was discharged home in good condition. Four months after the procedure, the patient had a routine confirmation HSG. Assessment of the HSG revealed that the left micro-insert appeared to be properly placed in the left fallopian tube (Figure 1). In contrast, the right micro-insert had an acute curvilinear appearance (Figure 1). As dye was injected, free spill was evident from the right side but the origin was unknown (Figure 2). The radiologist report stated the right fallopian tube was not occluded and the right micro-insert was not contained within the right fallopian tube. The patient was scheduled for counseling in regards to further assessment and management with presumption of a cornual or fallopian tube perforation. Figure 1: HSG image displaying an acute curvilinear appearance of right micro-insert. Figure 2: HSG image displaying free-spill from right side with injection of dye. In an outpatient follow-up visit, the patient was advised to proceed with surgical management due to concerns for bowel injury due to the device’s assumed peritoneal location. The patient reported that since her initial micro-insert placement she had vaginal bleeding for one month but no pelvic pain. The patient was consented for hysteroscopy, diagnostic laparoscopy, right salpingectomy, and possible cornual resection. Due to the patient’s strong desire to remove the entire foreign body, she requested a total hysterectomy if needed. This was thoroughly discussed with her and she consented to a total laparoscopic hysterectomy. On the day of her procedure, initial hysteroscopic evaluation revealed 30-40 trailing coils extending from the right tubal ostia (Figure 3). This was in contrast to the 3 to 4 trailing coils appreciated after the initial insertion. The left tubal ostia was clearly visualized with no micro-insert coils identified in the intrauterine cavity. Due to the length of the right-sided microinsert present within the uterine cavity, attempts were made to release and retrieve the micro-insert using hysteroscopic operative forceps. Resistance was appreciated and several attempts to retrieve the micro-insert only expanded the coils without release of the device. Figure 3: Thirty to forty trailing micro-insert coils visualized in uterine cavity during hysteroscopic evaluation. At this point a diagnostic laparoscopy was deemed appropriate to assess the pelvis for uterine or tubal injury and to identify both micro-inserts. A complete pelvic survey was performed and no uterine or tubal perforations were identified. A right salpingectomy was completed due to the patient’s request of permanent sterilization and the fallopian tube was examined with no luminal position of the micro-insert. The right cornua was thoroughly evaluated and there was no sign of the microinsert. Due to uncertainty of the micro-insert site, a second hysteroscopic evaluation was performed. Several attempts to remove the micro-insert from the right side by operative forceps were again unsuccessful. Due to the patient’s request of removal of the entire foreign body, the previously discussed and consented total laparoscopic hysterectomy was performed without complication. The uterine specimen was removed and thoroughly examined. Grossly, as noted by diagnostic laparoscopy, there was no evidence of perforation of the uterine serosa by either microinsert. The uterine specimen was dissected in a midline coronal manner superiorly from the cervix to the fundus and the device was found inserted superior to the right tubal ostia (Figures 4 and 5). On further dissection, it was discovered that the device was firmly embedded through more than half of the myometrium (Figure 6). Figure 4: Midline coronal dissection displaying the micro-insert penetrating into the myometrium. 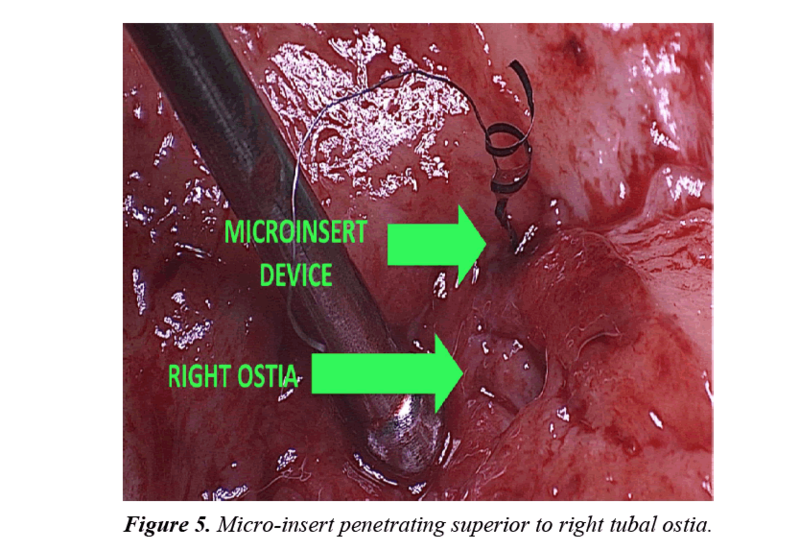 Figure 5: Micro-insert penetrating superior to right tubal ostia. 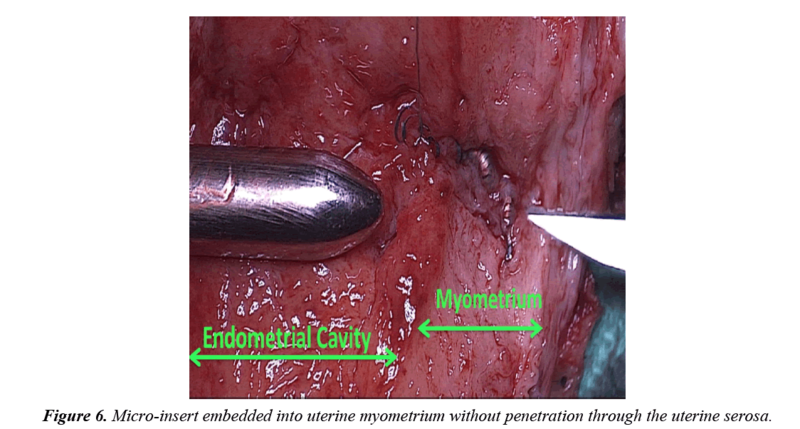 Figure 6: Micro-insert embedded into uterine myometrium without penetration through the uterine serosa. The mechanism of occlusion of the Essure® mico-insert device includes an inflammatory response of the fallopian tube to the micro-insert. The inner coil is composed of stainless steel and polyethylene terephthalate (PET) fibers and the outer coil is composed of nickel-titanium (nitinol). The fallopian tubes inflammatory response to these materials causes fibroblastic growth within and around the double-coiled micro-insert to occlude the fallopian tube lumen . Bayer states that an Essure® Confirmation Test (ECT) should be completed 3 months after micro-insert device placement to verify correct bilateral placement and tubal occlusion [9,10]. This confirmation test may be completed by either a HSG or transvaginal ultrasound (TVU) [9,10]. A patient is eligible for TVU confirmation if the placement is uncomplicated without visualization difficulties, there are no concerns of perforation, the procedure time is 15 minutes or less, 1-8 trailing coils are apparent bilaterally, the patient is not on any active immunosuppressive therapy, and the post-operative course is uncomplicated . In all other cases, an HSG is indicated. According to the HSG protocol, correct placement of the microinsert is based upon both tubal occlusion and location of both the inner and outer coil radiographic markers. Otherwise, placement is considered unsatisfactory for purposes of reliable sterilization . A too proximal location occurs when 50% or more of the inner coil is trailing into the uterine cavity while a too distal insert location occurs when the insert is in the tube with the proximal end of the inner coil >30 mm from the cornua . If the insert location is satisfactory but there is patency beyond the distal end of the outer coil or free spill is appreciated, a repeat ECT should be completed after an additional 3 months with alternative contraception during the interim . In this case report, although a TVU confirmation test was an option, an HSG interpreted by a competent radiologist was our confirmation test of choice. The HSG revealed no clear concerns for a too proximal or distal insertion; however, because of free spill of contrast media from the right fallopian tube and an acute curvilinear appearance of the right-sided device, it was clear that the mico-insert was not placed in the fallopian tube nor was the tube occluded. Four months after the initial insertion, partial expulsion of the right microinsert had also occurred with 30-40 trailing coils noted in the intrauterine cavity on hysteroscopy. After dissection of the uterus, it was apparent that the right micro-insert device was not properly inserted into the fallopian tube, but was in fact inserted into the myometrium. There are two critical clinical questions that arise from this case report. First, how was the right micro-insert inserted into the myometrium without any suspicion of malposition? Second, what mechanisms explain the retrograde movement of the micro-insert from the right tubal ostia 4 months after insertion? It is unclear exactly how the micro-insert was placed into the myometrium. One theory is that the device was not catheterized through the tubal ostia, but perhaps into a glandular-like opening or dimpling of adenomyosis. This might explain the lack of resistance at the time of insertion. Catheterization of a possible adenomyosis gland opening has been discussed in one case report that resulted in a likely cornual uterine perforation [11-13]. Common hysteroscopic adenomyosis findings include the appearance of several gland-like openings with and without blood as well as hemosiderin deposits within the endometrium . In this case, the endometrial gland-like opening or dimpling from adenomyosis may have been misidentified as a tubal ostium. Although the appearance of the endometrium in this patient suggests adenomyosis may be possible, hysteroscopy only detects adenomyosis in 10% to 20% of cases and cannot determine focal versus extensive disease . The final pathology diagnosis made no comment regarding adenomyosis. The expulsion of 30-40 coils visualized in the uterine cavity 4 months after insertion on the right side may be explained by recoil from a dense, non-compliant myometrial tissue. Unlike the compliant fallopian tube lumen, the myometrium’s dense non-complaint tissue likely rejected the device causing an initial post-procedure partial expulsion and then a later fibroblastic inflammatory response resulting in myometrial embedding (Figure 6). There are several take-home points that one can learn from this unusual case. First, due to the inflammatory properties of the micro-insert device, the more time the device is in place, the more difficult it will be to remove hysteroscopically. Second, removal of the Essure® device requires the removal of both the inner coil of stainless steel and polyethylene terephthalate (PET) fibers and an outer coil of nickel-titanium (nitinol). Third, when placing the device, it is imperative to have a clear visualization and identification of both tubal ostia prior to placement. This is especially important if there is a high suspicion of adenomyosis. Hormonal medications may aid in hysteroscopic visualization during the procedure. Fourth, while most patients’ malpositioned micro-insert devices can present with pelvic pain, in this particular case, the only symptom was menorrhagia. Lastly, if a malpositioned micro-insert is suspected, the patient’s desires regarding removal should be discussed thoroughly. If necessary, a possible hysterectomy should be considered and consented. While a hysterectomy is the last resort for the removal of a malpositioned micro-insert, it may be required for definitive management. In conclusion, to our knowledge, this is the first case to be reported of an Essure® micro-insert that has been identified embedded into myometrium without perforation through the serosa of the uterus. Management of an embedded myometrial micro-insert without perforation may be treated in a less invasive surgical approach, but it is difficult to determine the optimal treatment based on one case report. While our patient had only one month of menorrhagia without pelvic pain, it is uncertain whether pain may have developed with time and eventually require further definitive surgical management. However, a total laparoscopic hysterectomy was necessary in this particular case because of the patient’s request for removal of the entire device. Al-Safi Z, Shavell V, Hobson D, et al. Analysis of adverse events with Essure hysteroscopic sterilization reported to the manufacturer and user facility device experience database. J Minim Invasive Gynecol. 2013;20(6):825-29. Braginsky L, George S, Locher S. Management of perforated Essure with migration into small and large bowel mesentery. J Minim Invasive Gynecol. 2015;22(3):504-8. Ricci G, Restaino S, DiLorenzo G, et al. Risk of Essure microinsert abdominal migration: case report and review of literature. Ther Clin Risk Manag. 2014;10:963-8. Garcia AL, Lewis RM, Sloan AL. Essure insert expulsion after 3-month hysterosalpingogram confirmation of bilateral tubal occlusion and bilateral correct placement: Case report. J Minim Invasive Gynecol. 2013;20(1):107-11. Conover M, Howell J, Wu J, et al. Incidence of opioid-managed pelvic pain after hysteroscopic sterilization versus laparoscopic sterilization, U.S. 2005-2012. Pharmacoepidemiol Drug Saf. 2015;24(8):875-84. U.S. Food And Drug Administration. Meeting Materials of the Obstetrics and Gynecology Devices Panel. 2015. U.S. Food And Drug Administration. FDA Activities: Essure. 2017. Veersema S, VIeugels M, Koks C, et al. Confirmation of Essure placement using transvaginal ultrasound. J Minim Invasive Gynecol. 2011;18(2):164-8. Thoma V, Chua I, Garbin O, et al. Tubal perforation by ESSURE microinsert. J Minim Invasive Gynecol. 200;13(2):161-3. Glasser MH. Tubal perforation by ESSURE microinsert: A tubal perforation? J Minim Invasive Gynecol. 2006;13(5):487. Valle RF. Tubal peroration by ESSURE microinsert: Clearly not a tubal peroration but cornual-uterine perforation. J Minim Invasive Gynecol. 2008;13(5):487-88. Bradley, Linda D, Tommaso F. Indications and contraindication for office hysteroscopy. Hysteroscopy: Office Evaluation and Management of the Uterine Cavity. Mosby/Elsevier, Philadelphia, 2009.